They put all their eggs in one basket and didn't regret it once!!! 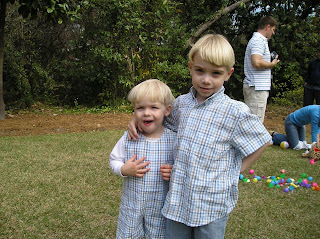 I love Easter! It is such a gorgeous time of year. It's a time to renew so many aspects of our lives. It's a great time to get together with friends and give thanks for all the things that add color to our lives. 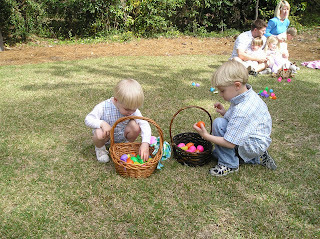 Sam and Fulton were invited to the Curry Family Egg hunt. They talked about it for hours after they got home. I think they had a fantastic time. Leigh and Malcolm put on a heck of a shin-dig! Fulton was sacked out for the rest of the day.